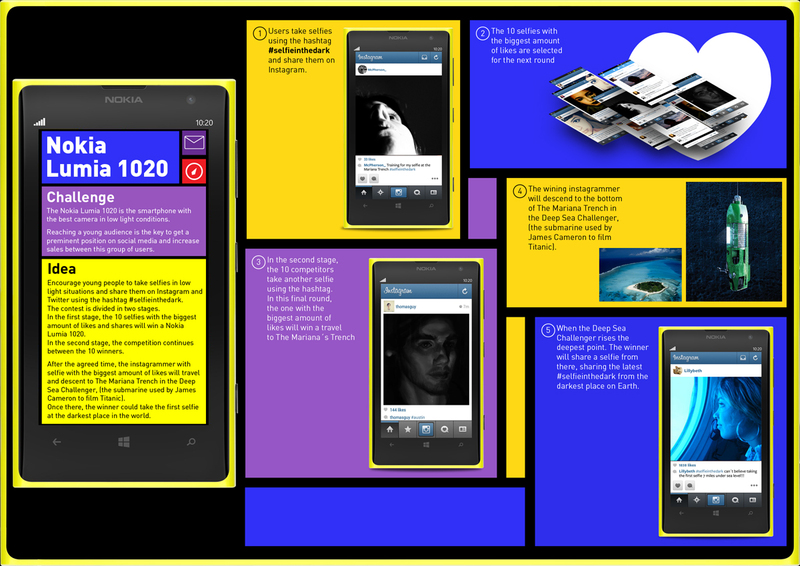 The Nokia Lumia 1020 is the smartphone with the best camera in low-light conditions. Reaching a young audience is the key to getting a prominent position on social media and increasing sales among this group of users. Encourage young people to take selfies in low-light situations and to share them on Instagram and Twitter using the hashtag #selfieinthedark. After 10 days, the 10 selfies with the highest number of likes and shares will win a Nokia Lumia 1020. In the next stage, the competition continues between the 10 winners over 10 more days. After 10 days, the winner will travel and descend to The Mariana Trench in the Deep Sea Challenger, (the submarine used by James Cameron to film Titanic). Once there, the winner could take the first selfie in the darkest place in the world.